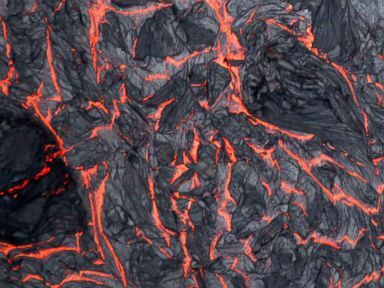 Incredible aerial footage released by the United States Geological Survey shows lava bubbling out of the Kilauea volcano on Hawaii’s Big Island, where at least 600 homes have been destroyed. 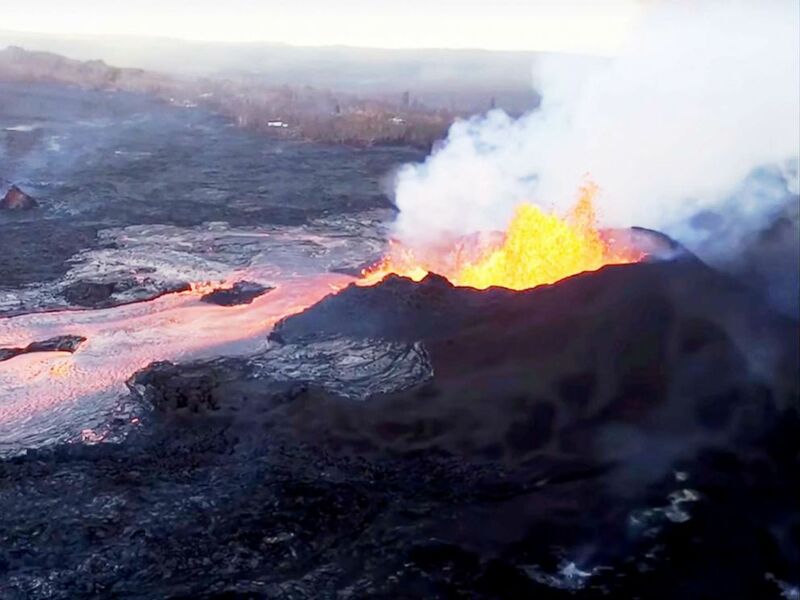 In the video, taken from a helicopter around 6:30 a.m. Tuesday, a fountain of lava feeds into a red-hot river and travels northeast, where it eventually enters the Pacific Ocean through Kapoho Bay. 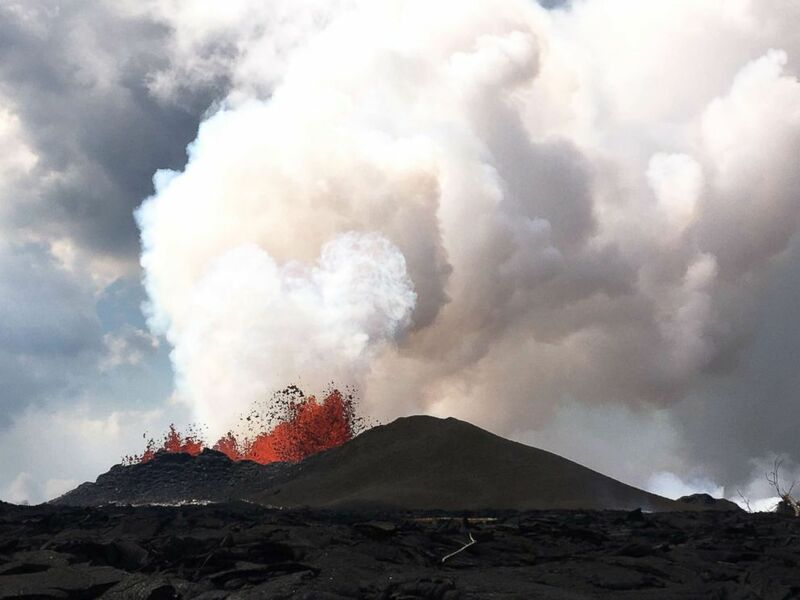 Video from the United States Geological Survey shows lava flowing out of Kilauea Volcano’s fissure 8 on Hawaii’s Big Island and then entering the ocean at Kapoho Bay and Vacationland. 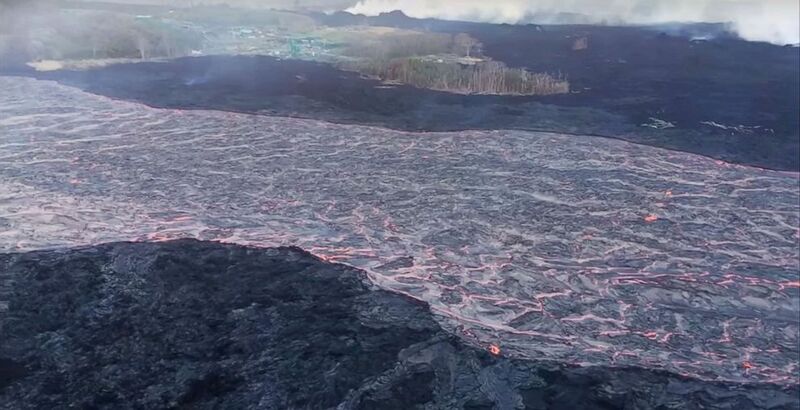 The lava completely filled the bay and built a delta extending nearly a mile from shore, according to USGS. Lava fills Hawaii ocean bay. The vigorous lava fountain at Fissure 8 reached heights of 150 ft as shown in this image taken on June 67, 2018. Thick clouds of smoke surrounded the coast as a result of the lava, according to USGS. 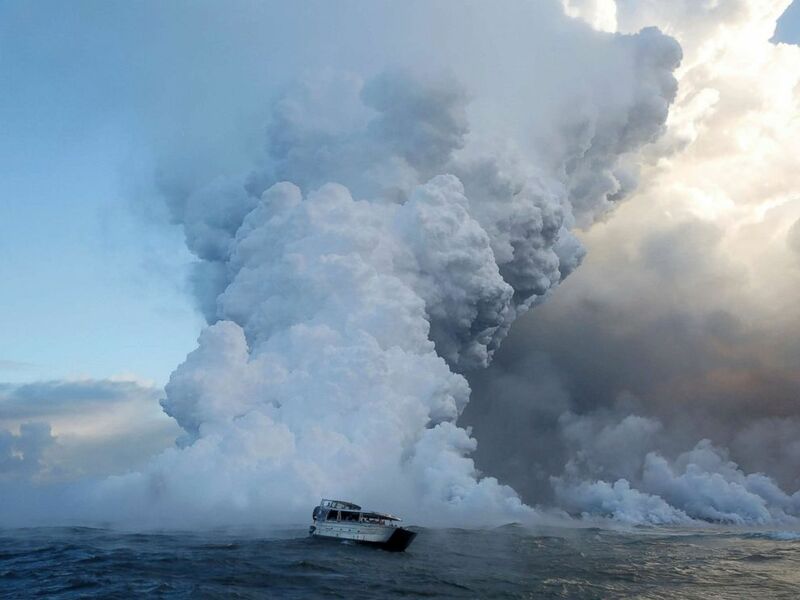 People watch from a tour boat as lava flows into the Pacific Ocean in the Kapoho area, east of Pahoa, during ongoing eruptions of the Kilauea Volcano in Hawaii, June 4, 2018. 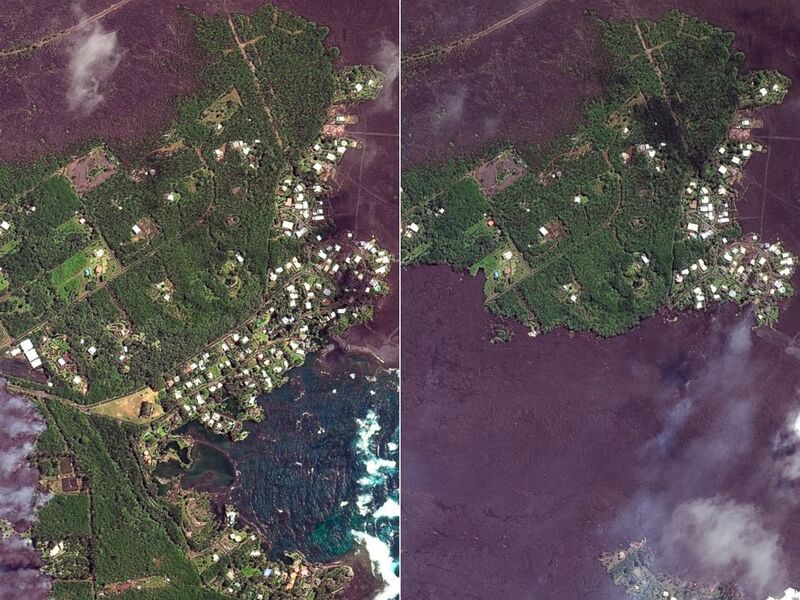 Before and after photos reveal a vast amount of land near Kapoho Bay now covered in lava. Lava approaches Kapoho Bay in Hawaii, left, June 3, 2018, and June 5, 2018. Lava from the Kilauea volcano destroyed hundreds of homes in a mostly rural area on the Big Island of Hawaii. About 500 homes were in the direct path of the lava, and hundreds of homes in the Kapoho Beach Lots and Vacationland communities were destroyed, the County of Hawaii Civil Defense told ABC News. 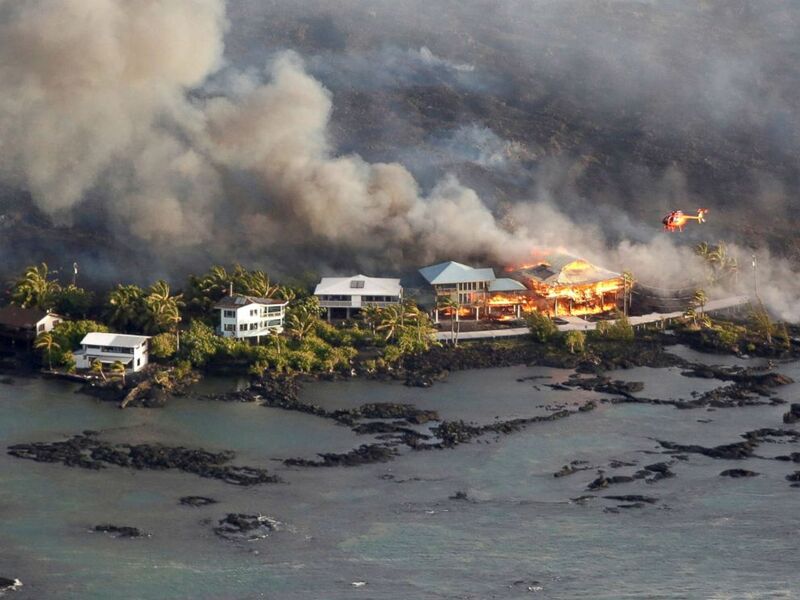 Of about 360 Kapoho homes, 320 to 330 have been destroyed. Lava destroys homes in the Kapoho area, east of Pahoa, during ongoing eruptions of the Kilauea Volcano in Hawaii, June 5, 2018. Around 4:30 a.m. Tuesday, the volcano began spewing ash nearly a mile into the air, sparking a 5.5 magnitude earthquake, according to the U.S. Geological Survey. 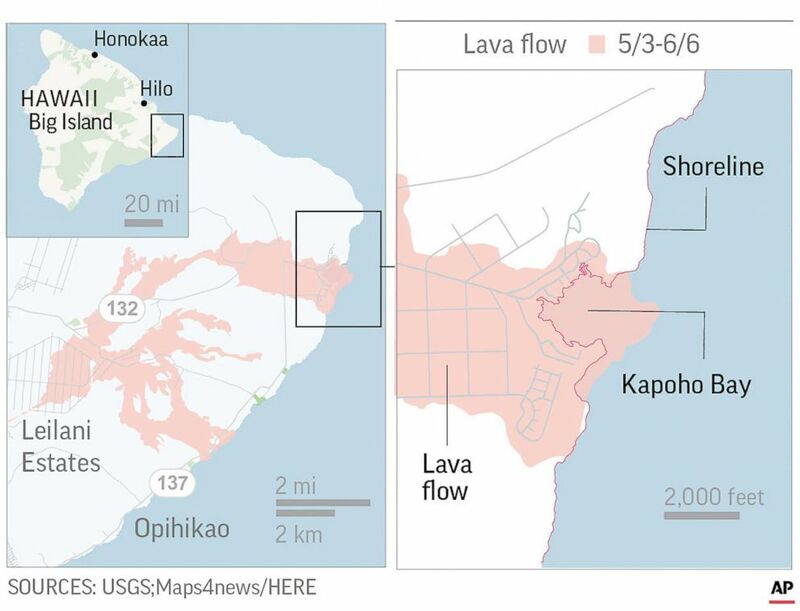 Lava began entering the ocean less than two hours after the explosions began and filled the shallow bay by 2 p.m. that day, according to the USGS. Thousands have been evacuated from the area, but officials fear that up to a dozen residents who decided to stay could be dead. The volcano’s valve is open and the volcano is going through “a cycle of deflation,” Wendy Stovall of USGS told ABC News. The volcano has been spewing ash and lava since the beginning of May.